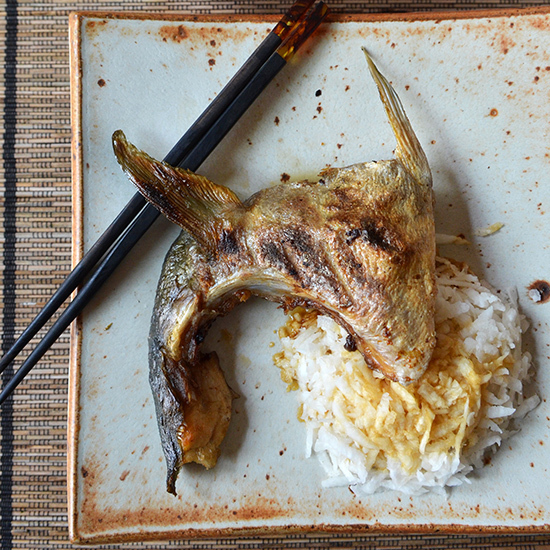 This broiled yellowtail collar can be made in a flash. When it’s served with rice and some oshinko (Japanese pickles), it makes the perfect summer meal. The foods of the Japanese izakaya (taverns) are among the most beloved in the world. There’s not a chef in the country who doesn’t try his or her hand at chawanmushi, ramen, soba, robata-style fish, yakitori and so on. Surprisingly, though, very few home cooks do. I’m not sure why. Myths abound about arcane ingredients and difficult techniques, but that couldn’t be less true. This is simple, easy bar food.